Many Emerging Food Brands we talked to since our first conference have been out-growing their commercial kitchens and are trying to decide between expanding their operations or move to a contract manufacturer or co-packer. Both routes come with risk. While financing operational growth by building out a plant is a significant investment, most folks say they are interested in exploring that route so they can maintain high-quality product standards. But are they correct? 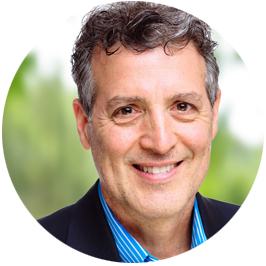 Will the product suffer in the transition to a co-packer? There are a lot of questions about working with co-packers and Emerging Food Brands brought them to the NewPoint Emerging Food Brands Conference. John Wisler: Consultant for the Food and Beverage Industry under Food and Beverage Consulting LLC, advisor to the Food Processing Supplier Association(FPSA) and International Society of Beverage Technologist(ISBT), supporting companies in the United States, New Zealand, China, and India. Mike Albregts: Owner at Pinhook Foods LLC, is a food industry consultant, and a Purdue Alum. Formerly with Kraft. 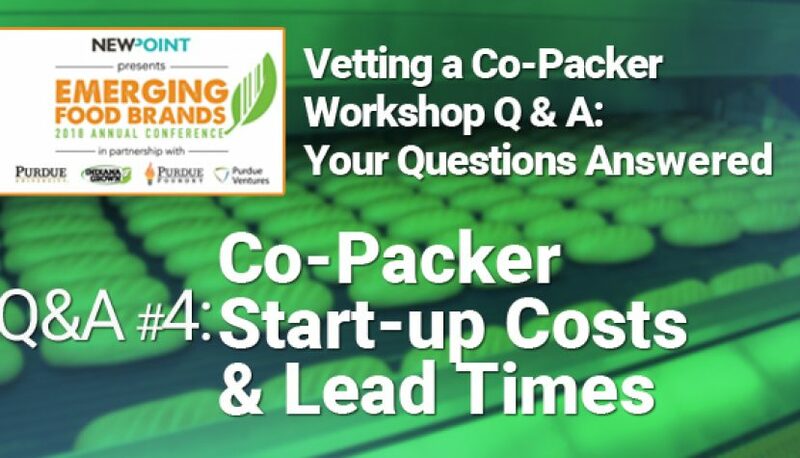 Vetting a Co-Packer Start-up Costs & Lead Times Question #8: How do you calculate start-up money when you first start using a co-packer? Mike Albregts: I think that depends on how big your run side is going to be. What’s your product value? Is it a $3 bottle of some sauce that you’re going to try to get a $5.99 sale price? Your run size is a big deal, so can you make something for $5000, maybe. Probably closer to $10,000 by the time you put something on the floor and have product available to sell. That’s just my general feeling about it. If you’ve got $1000, you are probably not going to be playing with a co-packer. Erik Kurdelak: If you’re buying all your own ingredients, then your initial run cost is going to be cost X. Your single individual, single entity, LLC maybe, buy these ingredients. If you are using stuff that is on the shelf, at a co-manufacturer, you’ve allowed for that flexibility, and they have some volume pricing discounts, and they’re buying at fewer dollars per pound. You might see cost implications even on the front end. There is a little bit of a sliding scale when you’re looking at those determinations. How do I forecast what those initial costs are going to be for this big run? Well, what all was going to be involved in that big run? Are you going to do it all yourself, or are you going to lean on others and other mechanisms for help? Mike Albregts: You can do that. You can be more involved, or it can be turn-key, and you show up, and the cases are packed, and it’s ready to go for you. They’ve done all the sourcing, and all the labeling, and all the nutrition facts, and all that stuff is done for you. So you could probably, depending on the packer, be involved as much as you want or as little as you want. 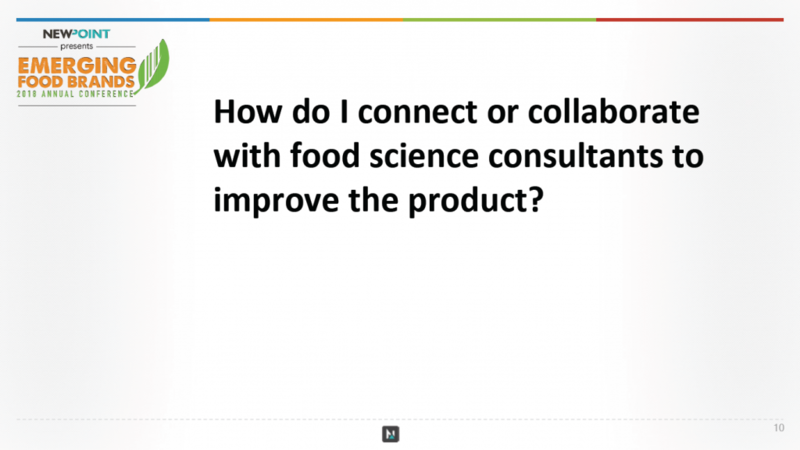 Vetting a Co-Packer Start-up Costs & Lead Times Question #9: How do I connect or collaborate with food science consultants to improve the product? Erik Kurdelak: You are very fortunate to be right here at Purdue University where we have one of the premier Food Science Departments in the world. We have experts in many areas. You could come to Purdue Food Science, and we can help you with things like process design, PH analysis, sensory panels, scaling, or micro. Then, of course, there are legal parameters. We offer a lot of different resources. There is going to be some cost associated with a lot of these, but we are not a commercial enterprise. We are not set up to be making money, but we do need to cover the necessary expenses. If I build you a system, that’s not free. I’ve got to pay students, I’ve got to pay clean-up. I’ve got to make sure that those things are covered. We work with a lot of people who start in product development, at the lab, then they go into the Pilot Plant, and, next, they can go into the co-manufacturer—and they’ve filled their toolkit in advance of those conversations. That said, it’s very inexpensive to go through Purdue University compared to a commercial enterprise. Alternatively, we’re not inspected space. I’m not a co-manufacturer. You’re not going to be able to come to the Pilot Plant and make eight skids of product. That can’t happen. What we care about is the data set. We say, “Under these conditions, using these ingredients, this is the data that’s produced.” We’ve retained a little bit of sampling, maybe for sensory, or maybe for some product testing, but we really care about product performance and how does that translate into scale up? How does that prepare you for those conversations with those co-manufacturers? 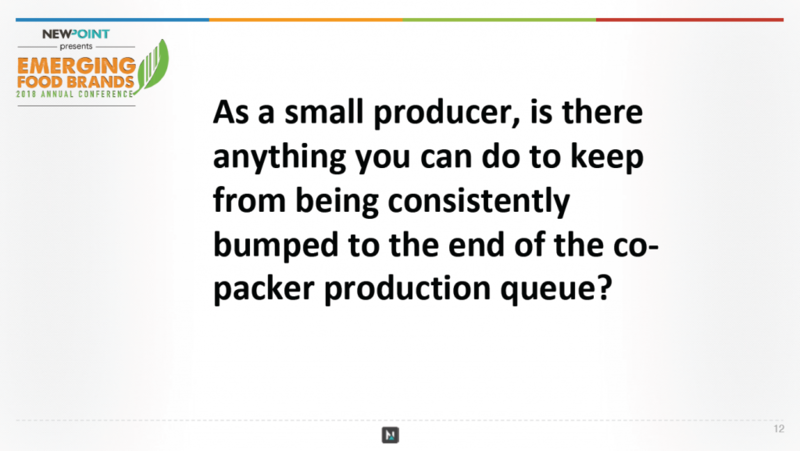 Vetting a Co-Packer Start-up Costs & Lead Times Question #10: As a small producer, is there anything you can do to keep from being consistently bumped to the end of the co-packer production queue? Mike Albregts: I’ve been doing business with the co-packers I work with for years. I’ll send them an order; they’ll send me a projected day and time when it’s going to be shipped. That date does sometimes vary if there’s an issue. For instance, just a couple weeks ago I had a beef stock that was in a product that was scheduled to be made, but they didn’t have all the ingredients. So the project got held up because I was waiting on one ingredient, so it got bumped back for that reason. You know, trying to get something manufactured, some of my stuff gets made in seven or eight days, some of it gets produced in three or four weeks depending on what it is and how big the volume is and if it has any specialty ingredient in it. John Wisler: If it’s a good co-packer, I mean if he’s reliable, he’s not bumping you. John Wisler: Look at it this way…I know they’re hurting for orders at a large crab packing processor today. They decide they need a contract packer. So they reach out and ask the co-packer: “Can you move us up?” The co-packer should say, “No, our lines are filled.” He shouldn’t budge or bump somebody. Mike Albregts: John makes an important point. Not only do small companies use contract packers, but massive companies like Kraft will also use a contract packer to make their products. People don’t think of that, but I can tell you, having worked for Kraft, some companies manufactured products that they used under their name, so you’re not the only ones that are looking for contract packaging. There’s a reason they do that and a lot of times its cost and just management. 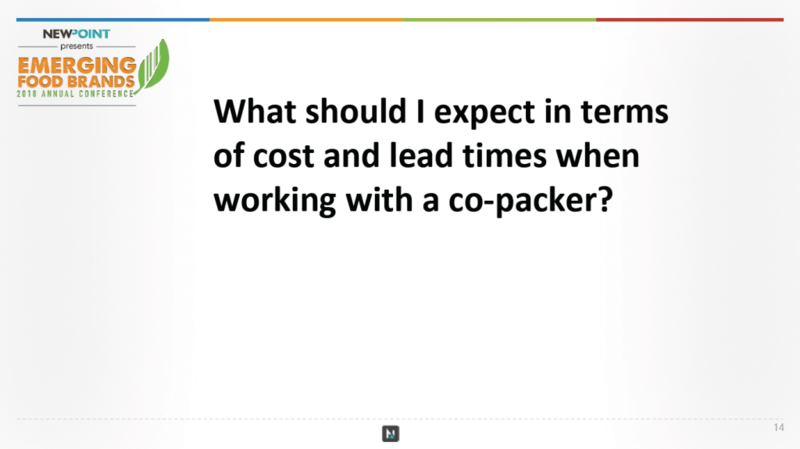 Vetting a Co-Packer Start-up Costs & Lead Times Question #11: What should I expect in terms of cost and lead times when working with a co-packer? Erik Kurdelak: I will tell you, we have tremendously complex schedules and calendars, and once something is scheduled, you want to hang on to that date. You want to run on your planned run date, and so sometimes there’s a lead time even at the Pilot Plant. I can’t take anything right now for at least six to eight weeks. I mean, it books in. It just books in so much. It depends on the volume, right, that the co-packer is encountering. Mike Albregts: Again, some products I have manufactured are made in seven, eight, nine days, and others are made in weeks. Knowing that ahead of time, because I just did one that had concentrated pomegranate juice in it, which wasn’t a standard item. So to get that product on the floor, the totes of that to make the product took a little extra time. They’re happy to sell it to you, but you may not get it as quick as you want to. So, these are things that, as you go forward, you have to be aware of. The other thing you have to mindful of is holidays. It just seems like every time I get a massive order on a new project they want it on the 23rd of December. It happens all the time. Or they want it on July 5th, and so you’ve got to be looking out. I was giving warning to a bunch of people on new projects last week, I said, “We’ve got three days that are essentially down on Thanksgiving, and one of my big packers goes down the 21st of December until January 2nd. They shut down over the whole period, so you need to be placing orders now, or you’re going to be short. This is the 4th and last in our series of “Vetting a Co-Packer” posts. I hope these were helpful as you navigate vetting a co-packer to help grow your business. Our next series will cover the Financing Growth Roundtable and Workshop. Look for those in the coming weeks.